This page describes how I made the large 11.75 X 43 inch grill for my 3-way vented speakers using my wife's idea of using screen door retainer splines. The reason for making this a seperate page is that I've found this mounting method to work equally well on all grills sizes. The grill consists of a wooden frame with grill fabric stretched over all four edges. One important goal in the finished grill is to keep the fabric stretched evenly over the entire length of the unit. In my case, this is 43 inches. Keeping consistent tension on the fabric is a problem. 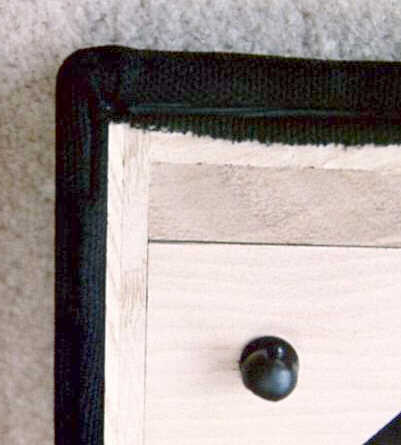 Staples may be used but they are difficult to drive into solid wood and they leave loose fabric dangling. Hot melt glue requires quick placement of the fabric which is diffcult when the fabric is long. Spray adhesives or contact cement can come through the fabric's weave. My wife's idea is to use the retainer spline found on aluminium screen doors to hold the grill fabric in a groove on the inside face of the frame. Splines are readily available in hardware or home centers as are the insertion tools. 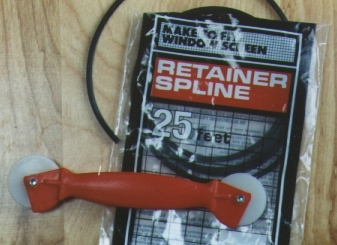 Both are cheap - less than $3 USD for 25 feet of spline and $5 of the tool. First, the frame is assembled using dowels and glue, making sure the frame is square by measuring the diagonals. Now cut the groove on the back side of the frame using a table saw. The actual size (width and depth) of the groove depends on the spline used, so make some measurements first. On my table saw and blade, the width of the groove I need is wider than one blade kerf but smaller than 2 kerfs so I need to make 2 passes with the kerfs overlapping each other. I run all four edges of the frame through the table saw for a first pass. Note that the depth is not as critical as the width - the depth needs to be deep enough to completely hold the spline while the width needs to hold the spline and fabric snugly. Run some additional scrap pieces at this table saw setting. Now adjust the table saw fence in very small increments to widen the groove and cut a new groove on a scrap piece. Test each new width by actually inserting some grill fabric and spline until the right width is found. Once the width is determined, run all four frame edges through the new blade setting. Installing the grill fabric is simple. The spline is inserted a few inches at a time, and only as much fabric as necessary is stretched at any one time. It's easy to make adjustments when needed. And since nothing is permanent, it's always possible to start over with different color grill material in case the room decor is changed ! When everything is satisfactory, trim off the excess fabric with a sharp knife and it's done. Here is the grill's upper left hand corner viewed from the back of the grill. The spline is visible on the upper edge of the frame. On the left edge, the trimmed fabric curled over the spline and is thus not visible. Also on the picture is a male grill connector mounted on a triangular corner piece.